The larger you can build a wind turbine, the more power it can generate. But you can only build them so large before they’re impossible to transport across the country. So GE’s engineers have found a better way to improve their efficiency: a giant 20,000 pound dome strapped to the front of the blades. It’s one of the more bizarre ways to help wind turbines generate more power, but also one of the more practical. Designed to be assembled on site, the ecoROTR’s large 60-foot wide dome would be easy to transport to areas where a wind farm would be ideal. 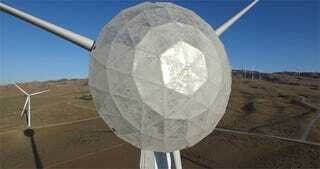 At first glance you’d might think a giant shield would actually block wind from hitting a turbine’s blades. But the ecoROTR’s dome serves to redirect and refocus the wind to the outer edges of a turbine’s blade—which are more efficient at harnessing a breeze than the inner sections. It also allows the blades to be made larger to catch more wind, but not longer, which is important because the large one-piece components are already difficult to transport. The engineers and scientists who work on GE Global Research’s sustainable energy projects are still in the process of testing and perfecting the ecoROTR dome, but their smaller scale experiments have already resulted in a three percent increase in energy production. That not might seem like much, but when you spread that across hundreds of turbines in a large wind farm, the additional output really adds up.